One day recently I was sitting in my office when a surprise package arrived for me. I signed for it from the delivery man and flipped the box over. What did I see? 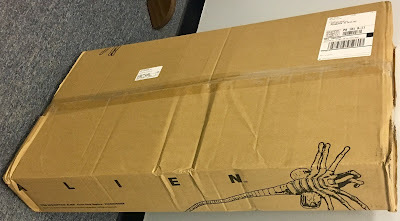 The word ALIEN with a big Facehugger on the side of the box. Earlier in the year NECA came out with the amazing life size Xenomorph egg. Due the popularity of that NECA smartly decided to release just the Facehugger by itself. This is great to all of the ALIEN fans out there who couldn't afford or didn't have the space for the Xeno egg. 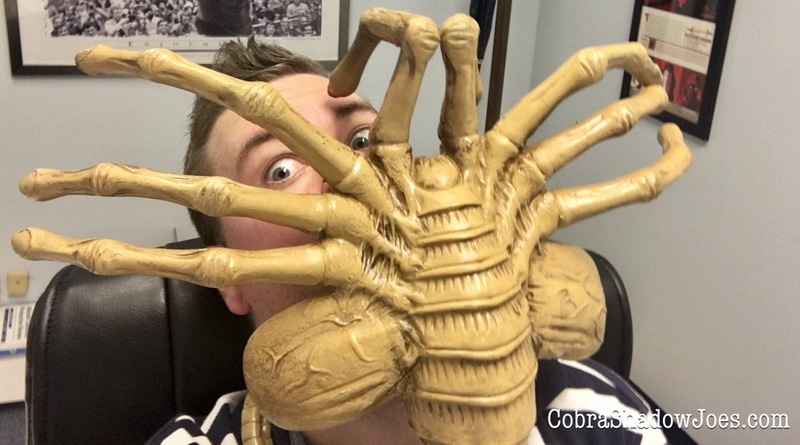 This Facehugger is fantastic! It is roughly three and a half feet long, has a bendable tail, is made of high quality foam and is hand painted. It definitely looks life like and the painting on the inside of it is especially well done. The bendable tail is great. It makes it easy to pose. I had no problem bending the tail around my neck as if it was about to attach to my face. The Facehugger is so realistic that it scares my wife so she won't even go near it. ALIENS fans have been spoiled to death by NECA as of late. Die hards and casual fans alike have finally gotten to add Frost, Vasquez, and Newt to their collections. Soon enough we will also have the long awaited Kenner inspired ALIENS that were shown at SDCC. There seems to be no end in sight of the possibilities NECA has with the ALIENS line! A big thank you to NECA TOYS. To buy your very own NECA Life-Size Facehugger head on over to Fresh Figures. J'ai commandé une réplique de montre ici. Lorsque j'ai reçu la montre,réplique montres à vendre cela m'a beaucoup surpris: cette montre est parfaite et la qualité est exactement la même que celle de la vraie montre. Une maçonnerie éblouissante.réplique à vendre rolex yacht master montres J'ai présenté ce site Web à mes amis et ceux-ci l'ont beaucoup aimé.